DLA Piper has graciously offered to provide a copy of Reshma’s book and breakfast for all in-person attendees. TOPIC: Brave, Not Perfect. Do you ever feel crushed under the weight of your own expectations? Do you often lose sleep ruminating over a tiny mistake or worrying about what someone else thinks of you? Do you run yourself ragged trying to do it all at home and at work, with a smile and not a hair out of place? Have you ever passed up an opportunity – a new relationship, new job, or new challenge – because you’re afraid you won’t immediately excel at it? Is failure simply not an option? If you answered yes to one or more of these questions, you’re not alone. As women, we’ve been taught from an early age to play it safe. Well-meaning parents and teachers rewarded us for being quiet and polite, urged us to be careful so we don’t get hurt, and steered us to activities at which we could shine. Meanwhile, boys were expected to speak up, get dirty, play rough, and climb to the top of the monkey bars. In short, boys are taught to be brave, while girls are taught to be perfect. At this event, Reshma Saujani, New York Times best-selling author and Founder of Girls Who Code, will show us how to end our love affair with perfection and rewire ourselves for bravery. 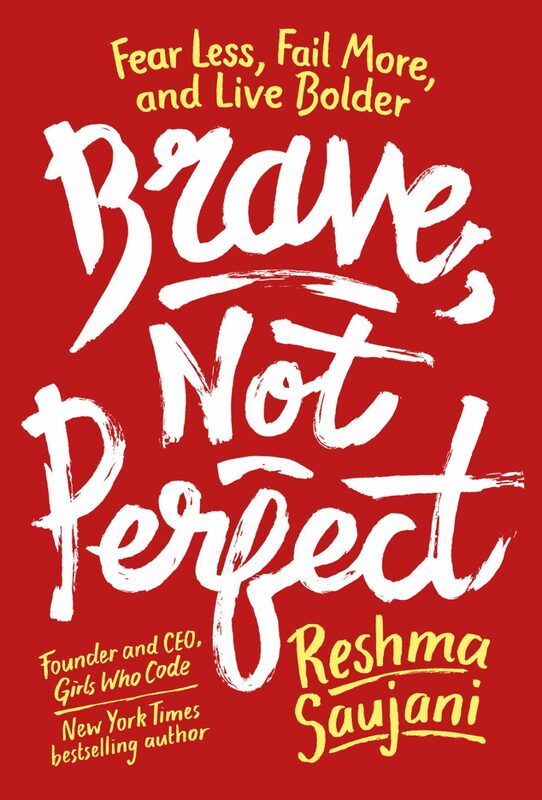 With probing questions posed by author and workplace expert Debbie Epstein Henry, Reshma will share the findings of her book, Brave, Not Perfect, motivated by her TED talk on the subject that had over four million views. Drawing on her own personal journey and hundreds of interviews with girls and women changing the world one brave act at a time, Reshma will inspire us with an array of powerful insights and practices to make bravery a lifelong habit and enable us to be the architects of our biggest, boldest, and most joyful life. DISTINGUISHED GUEST: Reshma Saujani is the Founder and CEO of Girls Who Code, the nonprofit organization working to close the gender gap in technology while teaching girls confidence and bravery through coding. Girls who Code has become a movement, reaching almost 90,000 girls of all backgrounds around the country. A lifelong activist, Reshma was the first Indian American woman to run for U.S. Congress. She is the author of three books: New York Times best-seller, Girls Who Code; Brave, Not Perfect; and, Women Who Don’t Wait In Line. Reshma’s TED talk, “Teach girls, bravery not perfection,” has more than four million views and has sparked a national conversation about how we’re raising our girls. She is a graduate of the University of Illinois, Harvard’s Kennedy School of Government, and Yale Law School. Reshma has been recognized for her work by many organizations including being named one of Fortune’s World’s Greatest Leaders, Fast Company’s 100 Most Creative People, a WSJ Magazine Innovator of the Year, Fortune’s 40 Under 40, Crain’s New York 40 Under 40, one of the 50 Most Powerful Women in New York by the New York Daily News and one of Forbes’s Most Powerful Women Changing the World, among others. She serves on the Boards of She Should Run, which seeks to increase the number of women in public leadership and Overseers for the International Rescue Committee. Reshma lives in New York City with her husband, Nihal, their son, Shaan, and their bulldog, Stanley.